Wedding cakes have long been a very traditional affair; a staple of any wedding with the enduring tiered style dating as far back as the 1800s, when Prince Leopold of Albany had an iced and stacked tiered cake, which was the first to be completely edible. A traditional wedding cake flavour would be fruitcake, and the decorations kept to traditional piping or sugar flowers. 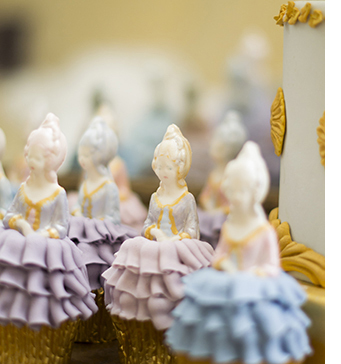 However, the styles of wedding cakes available these days are a far cry from the traditional cakes of the past. Wedding cakes now are designed to be the centrepiece of a wedding, and will often be the first thing that draws the guests’ attention when walking in to the wedding venue. Therefore couples are making absolutely certain that whether it’s a big showstopper, or a more discreet and simple affair, there is a very definite fascination about the cake, making it deserving of the centre-stage spot. This emphasis on the cake as a centrepiece has encouraged cake designers to push the boundaries in cake design and develop some very innovative styles of wedding cake. From the type of cake to the type of the decoration, there is a myriad of popular new styles to choose from. Cakes are becoming increasingly tall, with extra height tiers, separators, and tall pedestal stands. This style of cake has become very popular as the height guarantees it will be impressive. On the flip-side of this, another popular trend is for lots of individual cakes. These are especially popular as a less formal alternative to the traditional tiered wedding cake. Decoration-wise, there is also something for every taste. Gilded cakes, painted with metallics or brushed with edible gold and silver leaf, can be extravagant and ‘blingy’, or vintage and antique depending on the shade of the metallic. For an even more glitzy style, you can now have ‘cake jewellery’ adorn your cake too. Another equally beautiful trend is hand-painting on cakes. This is an elegant style with limitless possibilities. For those looking for something more simple, yet still innovative and stylish, there is the ‘naked’ cake. This is a type of cake that has no icing but can still be decorated like a wedding cake, with fresh flowers or a cake topper for example. It’s a great option for those who don’t like the thick layer of sugar-paste icing, but still want a centrepiece wedding cake!